Sardines are yummy. If you haven't actually tried them, I bet you'll be surprised. Plus everyone in Europe eats sardines. An entire continent can't be wrong. Peer pressure man, peer pressure! This is an awesome little salad that comes together quickly and easily scales for just one to a crowd. 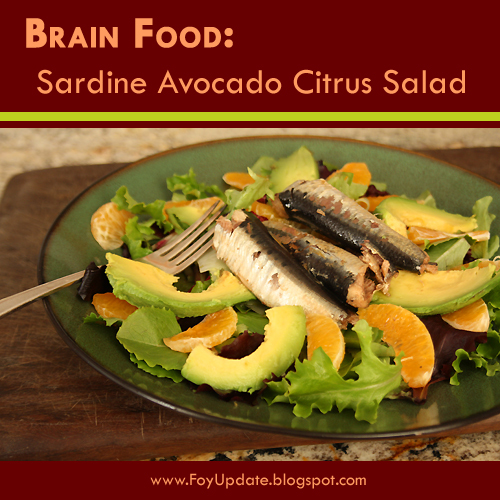 The oily sardines are cut by the citrus and the avocado adds a nice creamy factor. To make the salad feel more like a dinner menu item I saute an onion and at the very end add the sardines to heat them up. Then I use the sardine oil, plus a little balsamic vinegar and sherry to make a simple dressing. That's it. All of 15 minutes and you're ready to eat. Plus since I'm doing the Wahls Diet this month this salad has three cups of greens, half cup of avocado, one orange for bright colors, one leek or onion for sulfurous veggies and four ounces of sardines which count as the weekly organ meat as well as the four ounces grass-fed meat or wild seafood. It's true sardines are better than tuna. Sardines have fewer heavy metals like mercury because they are lower on the food chain. Heavy metals bio-magnify man! Tuna are in danger of being over fished. No one is worried about the sardine population. Both tuna and sardines are an excellent source of omega-3 fatty acids, but sardines have more! Since we eat the whole fish including the guts and bones of sardines; they are a good source of B12, Vitamin D, iron, potassium, co-enzyme Q10, phosphorus and selenium. Guts and bones, delicious and nutritious! And the lastly, sardines are less expensive than tuna! Hurrah for sardines. My favorite variety of sardines is Wild Planet. The sardines have a fairly mild flavor and they are sustainably caught off the California coast. Wild Planet uses BPA free tins for all their products. I find them in the natural foods section of my grocery. They are very similar in cost with other canned sardines. Although if you really don't like sardines, but do like tuna. Tuna would be a yummy substitution. I don't think I'll have to write persuasively to convert people to oranges and avocados. You know those are delicious, right? On to the recipe! This recipe is a combination of Joy the Baker's Spinach Feta Blood Orange Salad and Alton Brown's Sherried Sardine Toast. I took out the toast and the feta since dairy and gluten are not allowed on the Wahls Diet because they are common allergens. Basically I put the sardines and dressing of Alton Brown's recipe on the salad recipe from Joy the Baker and it is delicious. You're welcome. Alternatively this makes an excellent cold lunch. 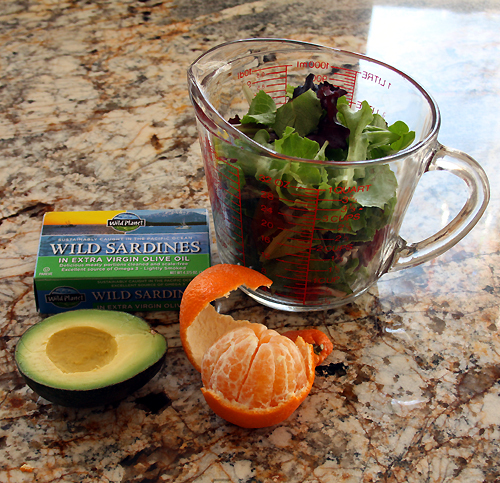 Just pack the sardines, sauteed onions and dressing in one container and the greens, avocado and orange in another. 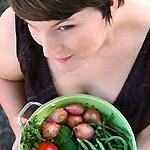 Dump the sardine container into the greens container and enjoy! I will have to check out the Wahl's diet. How have you been doing with it? Is it difficult to keep on? Oops, sorry, should have written Wahls w/o an apostrophe. Hey Drema! I've been working towards this diet since May, but this January is the first time I've committed to it entirely for a month. I will have done a full month on February 6th. I'm always interested in living a healthier life. For some reason the food end is more fun than the fitness end! Sardines are a sustainable fish, rich in nutrients, and low in toxins--good reasons to learn to like them. This looks like a great way to help do that. Thanks for posting! We will just love this combination for a salad. Have a great week and thank you so much for sharing your awesome recipe with Full Plate Thursday.